Team NiSCA announced today that it partnered with DVR Consulting Inc. to provide an ID card printing solution for Apple Computer-based K-12 school systems. With school budgets tight there isn’t money to buy a PC for student IDs. This latest update to the card printer enables schools with Apple Computers to use the NiSCA PR-C101. 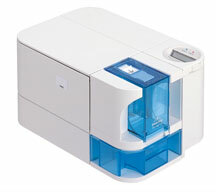 Introduced in 2007, the PR-C101 plastic card printer was designed with the small organization in mind. It offers a an out-of-the box solution for high quality, high durability, plastic cards with low maintenance requirements. Average time between failure is 50,000 cards. The PR-C101 is small enough to fit in an office overhead bin or under a counter making it perfect for a school’s small office environment and it comes with an entry-level badging software application. In June 2009, the PR-C101 will offer a Mac application driver. Mac based schools do not always have the latest processors. This software supports both Mac PowerPC and Intel hardware and Mac OS/X 10.4 and 10.5; therefore, no need to switch or upgrade processors or operating systems. Printer sharing is available. Staff members can print badges from multiple locations. Additional features of the Mac application driver include Colorsync support and magnetic encoder support.